If you quickly want to find out what the best inflatable paddle board for dogs is, I’d recommend the Hala Rado Inflatable Stand-Up Paddle Board. For the best hardboard paddle board for dogs I highly recommend the Isle Versa Epoxy. I remember the very first time I saw a dog on a paddleboard, let along actually seeing a paddle board for the first time. I was in shock, “how the heck… whaattt?” . It was a bulldog perched right on the front of the board while a man was just casually paddling. Fast forward eight years and this is becoming more and more of a commonality. There is no doubt that pet owners want the absolute safest set-up for their pets but just the fact of having your dog on a paddle board with you is enough to give you an anxiety attack for the ages. I get it, I used to be a pet owner as well! In this guide I go through what the best paddle board options are out there for pet owners, including both inflatable and hard board models, as well giving you a full guide on how to actually get your dog to go on the paddle board with you. This is a process where you have to have a bit of patience but the rewards can be massive as you have yourself a new paddling companion! Let’s be honest Dogs are the best company out there. So you feel that your dog would be the best companion out on the water with you, frankly I think it makes perfect sense! Now you have to be able to choose what kind of paddle board would be best for both you and rover. When starting out this activity there are a couple of things to keep in mind. Stability is definitely the name of the game when paddle boarding with dogs. You want a board that can not only feel stable for both you and your fur baby, but also a pet SUP that can absorb waves without feeling too tippy. 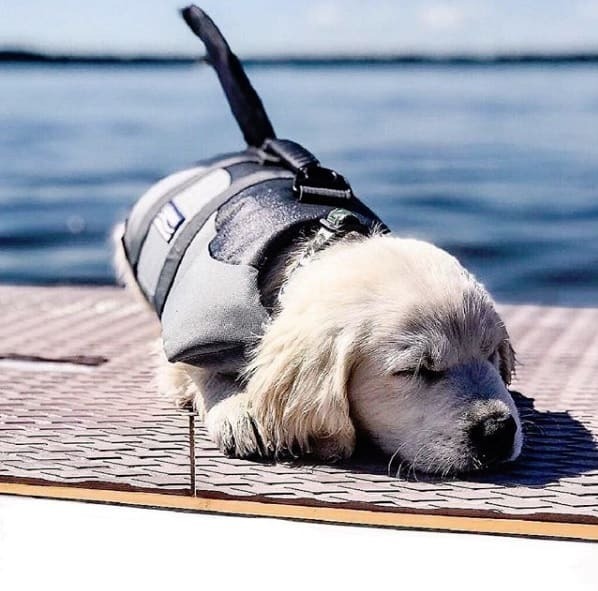 As you and your dog feel more comfortable on the water you can eventually upgrade to a faster touring board like the Sea Eagle NeedleNose 14. I touched on this a bit but choose a board that has a maximum capacity of about 40 lbs more than the total weight of you and your dog together. There is a big difference in weight when you have a chihuahua on your board versus having a bigger dog like a Rottweiler or a German Shepherd. A good hack is to weigh both yourself and your dog at the same time at the vet’s office to get an idea of what the combined weight would be. You want a paddle board that has a decent sized deck SUP Dog pad for grip for both you and your pup. If you get a full epoxy board with no grip pad you run the risk of you or your dog falling off the board. The first thing I must stress is that you must consider the temperament of your dog. As a dog owner you know that each dog has a different personality and temperament when it comes to trying new things and trying the water. I had a border collie growing up and while he actually did love the water quite a bit I knew that he was not the ideal candidate to take to paddle boarding instantly. He had the temperment where he was more cautious and would think things through before rushing in and doing something new. I’m sure many border collie owners can relate 😛 . Where am I going with this? Your dog’s temperament will dictate how long you will have to train them to get onto the paddle board with you. There will be circumstances where your dog may be absolutely terrified of water, if you still want to go through with this activity it will require patience on your end. The next most important factor is your skill level. If you are brand new to paddle boarding then I strongly recommend that you get at least 10 paddling trips under your feet before attempting to paddle with your pup. You need to learn the ropes in terms of balancing on the board standing up and learning to take waves and swells that come at you because you definitely will encounter some! If you are a beginner make sure you pick a good all around board to start off with as those are the most stable and have the best learning curve to quickly get onto the water. Another factor to consider is the size of your dog. The size and weight of you and your dog combined should be at least 40 lbs less than the Maximum Capacity of the board. If you have a bigger dog go with a bigger maximum capacity. Isle Paddle Boards also have some good tips as well. I strongly recommend you get a doggie PFD and a PFD for yourself as well. While dogs can instinctively swim it is a heck of a lat harder trying to get a struggling lab back on your board when you have nothing to grab. Dog PFDs, while at first sounding ridiculous are actually a very good idea because they have a handle on the back. This means should your pup decide to jump overboard because of a glare a duck across the pond gave him (it will happen from time to time), you can easily pull your dog back onto the board. It is also a great idea because you and your dog could tire which would be a very bad scenario indeed. Leave the Leash at shore, this may sound a bit counter intuitive but you don’t want your leash to get wrapped around your dog affecting his ability to balance or even swim should he or she fall off. Probably one of the first things you may have thought about is what about the claws? Can’t the easily puncture the board and you both fall spectacularly into the water? Well no. Inflatable Paddle Boards are not made of the same materials as pool toys. They are reinforced with drop stitched materials inside followed by MSL fusion composte, MSL airtight coats and a deck pad. I personally own an inflatable paddle board and I can tell you it is solid if pumped up to 15 PSI and above! Seriously you can smack against almost anything and the board will simply bounce off without any punctures. In many ways Inflatable paddle boards are actually more durable than hard boards because of this. You can read more in my article Inflatable Paddle Boards vs Hardboards. So the question becomes..
Why use an Inflatable Stand Up Paddle Board with Dogs? The Hala Rado is an excellent inflatable paddle board to go paddling with your dog. It is 10 feet in length and has a width of 34 inches. The extra inches make sure that your paddle board is stable which allows your dog to enjoy the adventure. In addition to the extra width, the Hala Rado also has Quad 3 inch side-bite fins which are glued on and has a 4-inch StompFin which is retractable. This adds to the stability of the stand-up paddle board. The board is perfect even if you are large and have a large dog with you. The board can easily carry two full grown adults so carrying a person and a dog is easy. The Hala Rado is very sleek and it is easy to maneuver. You can enhance your tracking and speed with the tip-to-tail rocker on the SUP. It’s size also gives it good stability, especially when the water is choppy. The Hala Rado has a Stompbox center fin which is patent pending. This retracts if it gets in contact with rocks so you can easily use it in shallow water. The paddle board has a 3-year manufacturer warranty. This warranty is for workmanship and material defects though we haven’t read any negative reviews online about the quality. The size makes the paddle board excellent when it comes to having a dog or even another person with you on the paddle board. Even though the size of the board is large, it is very easy to maneuver. It is very stable and very responsive when it comes to paddling down the river or even in the ocean with swells. At 12 feet in length and 30 inches in width, the NRS Escape SUP board gives you great performance in the water while having your dog for company. You can do a fast workout in the morning or indulge in a relaxed afternoon tour on the NRS Escape Inflatable SUP. It has a carrying capacity of 250 pounds so you can carry a lot of gear along with riding the Sup with your dog. Customers liked the look of the SUP and its workmanship. They mentioned that it was well reinforced. It has a 6-inch thickness and is very firm. The weight is reasonable and the foam pad which comes on the SUP is comfortable though it is thin. It didn’t burst even when it was inflated to 25 PSI. Even in a heavy wind, the SUP didn’t get unstable. The NRS Escape Inflatable SUP has a dual construction of its sidewall. This gives the SUP a lot of durability and also improves aesthetics. The drop-stitch construction of PVC ensures that the SUP can stand a fair amount of bumps and scrapes. The NRS Escape Inflatable SUP has a webbing handle that is in the center of the SUP. This makes it very easy to carry the SUP when you are on shore. It also has two handles that are on the front side of the SUP. This allows you to dive in for a swim if you wish. The NRS Escape Inflatable SUP comes with a pump which is of high-pressure and has a gauge. This makes filling the SUP till its required 20 PSI very easy. It also comes with a repair kit, a backpack for the SUP when deflated and a carry sling if you wish to carry it on your shoulder. The Sea Eagle NeedleNose is made for increased floatation, stability, and rigidity. This makes it a perfect inflatable paddle board to use with your dog. The bow is wave and water piercing so you can paddle further with ease even with the weight of your dog. The Sea Eagle NeedleNose is perfect to use for meandering rivers, large lakes, inland marshes, open bays or the ocean. The Sea Eagle NeedleNose 14 gives you an excellent combination of flotation, performance, and stability. The SUP board is made of reinforced material so you don’t need to worry if you bump against rocks when you are in the water. Even when you bump against rocks and when the water is rough, the SUP is very stable and you don’t have to worry about your dog falling off. Customers loved the Sea Eagle NeedleNose. They tried paddling in it with their dog and mentioned that it was very easy to do so. The Sea Eagle NeedleNose is very easy to deflate and inflate as per your need. Your dog will find it easy to balance on the SUP board and won’t slip off as it may on a board that is narrower. Hardboards are a decent choice when it comes to choosing what to paddle with your dog. They offer more stability for you when paddling in the water. This is because you are not so high off the ground, but instead the board sits in the water which gives it a more stable feeling, especially for beginners. They are also a bit quicker in the water. This may not be ideal for when you first start out but as you go for more runs with your paddling pooch you will want a board that has a bit more glide per stroke. Why a Hardboard SUP with your Dog? The Isle Versa Epoxy is a great choice for dog lovers because if features the soft top, it is lightweight and it is extremely durable meaning that it can take some a bit of a beating, claws and all. The Isle Versa Epoxy is a great All – Around board in which you can use it for a variety of different activities other than paddling with your dog. The soft top makes it an idea YOGA BOARD but it can also be used amply for fishing or even surfing as well as casual day paddles with the kids. The Isle Versa Epoxy is one of the more affordable hard boards out there which features ample stability. Stability is one of the things the things that I look for when I am introducing my dog to paddle boarding as you pup may take some getting used to being on a board surrounded by water. It especially handles choppy water pretty well which I believe is another crucial aspect when looking for a good paddle board to use when training your pup. Customers really appreciated the fact that this board is light weight. Especially when you have a dog with you, you don’t want to be juggling an overly excited pup with a heavy board at the same time. Other customers loved the fact that it was very easy to paddle and stand on making it a great learning board. Lots of customers especially appreciated the traction pad. You get 60 days to try it! The Naish Nalu GTW is a very versatile SUP board and you can easily use it to paddle along with your dog. It is easy to carry and it has a lot of space on the deck for your dog and you. It has a full-length deck pad so your dog can comfortably walk around the deck. The Naish Nalu GS is excellent in flat water or in the surf. You can use it along with your dog in any type of water body. The Naish Nalu is great when it comes to classic surfing or when it comes to paddling on flat water. You can use it on flat water and on the waves. It is thinner than most of the SUP boards that we have reviewed for paddling with your dog, however, it has a firm deck pad which gives traction to your dog which we consider an advantage. Even if you are out on a long adventure, your dog won’t feel cramped as it can stroll on the deck because the full deck is embossed. The Naish Nalu is a well-rounded board and gives you a lot of versatility. The wood reinforcement which is there in the area of standing gives it more durability and gives you better stability. The board has a closed cell core which is molded which makes it resistant to leakage and ensures that it is light for a SUP that is a hardboard. Customers found the Naish Nalu GS very easy to use. It is very stable and the deck pad provides excellent traction. They found it a perfect balance between speed and stability. It looks great and is solidly built. The Pau Hana Endurance SUP board is the perfect board to use if you plan to tackle rough water with your dog. The SUP board is made of impact-resistant technology and it has a polymer skin instead of traditional exteriors. This feature gives the SUP board an impact resistance of 900 pounds per square inch. The hull of the Pau Hana Endurance SUP board is made of fiberglass. This allows the Sup to smoothly glide on the water. It is very easy to paddle the board. Even when the SUP is fully loaded with gear, your dog and carrying your weight. The Pau Hana Endurance SUP board has Seamount points which are well placed. This allows you to accommodate D-rings, cargo nets, camera holders, drink holders, and rod holders at the rear or on the front of the board. One of the best features of the SUP board is that it has a deck pad which is soft and thick. The SUP board has handles on its tail and on its nose. This makes it very easy to drag it to your vehicle and to pull it out of the water. It is an excellent SUP when you are planning a multi-day adventure with your dog. The length of 12 feet is great as your dog gets space to stroll and stretch its legs. It is very stable and reasonably quick. The SUP is durable and is great fun to use it when you are downwind paddling. I recently wrote a guest post on this topic for Love and Kisses Pet Sitting during the Spring on How to Paddle board with your dog . I’ll summarise below. When starting out unfortunately it will not simply be as easy as placing your dog onto the board and majestically paddling off into the distance. You have to get you pooch accustomed to it first! Simply place the board in the back yard or your house and encourage your dog to go on it. chances are they will be hesitant at first but you can speed the process up by simply placing a treat onto the board. As he starts doing this encourage your pup to sit and stay on the board. This will make it more manageable in the future when you both are on the water. Yes the above heading seems to be a bit counter intuitive but you will need a special command to get your dog to jump off the board. The reason behind this is that it is a measure to insure that your dog does not get distracted by other critters roaming around in the water. He only gets off the board when you tell him to! If he listens reward him with a treat! You pretty much repeat the exact same steps but this time it’s your turn to be on the board with your pup. Practice the same sit, stay and get off commands and reward him. As he starts mastering this you can start gently rocking the board to make him comfortable. Reward him with a treat again if he keeps staying on. Once your dog has passed all the above tests with flying colors it’s time to hit the beach. One thing though, you still won’t be going on your maiden voyage yet! What??! This step is to make sure that your dog is still comfortable with the commands, just in a different environment. As he progresses you can start heading to the water and encouraging him to jump onto the board. Do this in the shallows as your dog may still be nervous of being on a giant unpredictable floating board. Practice the sit and stay commands and as he aces these then you can jump onto the board with him and repeat the same steps. Don’t paddle away yet until he is fully comfortable and is listening to your commands. Ok NOW you can go on your Maiden Voyage! Now that poochy is comfortable on the board you can start paddling, but stick close to the shallows as chances are this will take a few goes unto he gets it right! How quickly this happens depends on how comfortable your dog is with water. Keep to your commands! Now that you may be suffering information overload let me just relay some things so you don’t feel too overwhelmed. When learning how to SUP with your dog patience is key. Your dog may love or hate the water so how fast they learn depends on this. Other things to consider is get a dog PFD (and one for yourself) and make sure to leave the leash on shore. The Best Hardboard for dog is the Isle Versa Epoxy because of its affordability and stability which makes it an ideal choice for those starting out. The best Inflatable paddle board for dogs is the Hala Rado Inflatable Stand-Up Paddle Board due to it’s size, stability and its versatility including a retractable fin that can go back into the board if it hits something in the shallows.